Trivandrum, 1 September 2011: The 24 hour call centre was inaugurated by the Chief Minister Oommen Chandy at his office today. The initiative which is a part of the 100 day programme of the UDF ministry will offer a 24/7 platform for the people of Kerala to lodge their complaints and suggestions to the government. The 24x7 call centre would facilitate people to register their grievances and complaints directly to the Chief Minister’s Office by telephone. 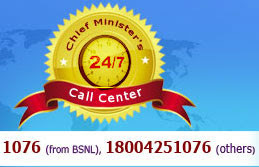 The call centre would function 24x7 and can be accessed on 1076- toll free number, for BSNL customers. Those using other services will have to dial 1800 425 1076 for accessing the service. People calling from abroad have to fix the code 0471 before the toll free number. The first petition which was lodged in the call centre was from the son of C.S Suresh Kumar a KSRTC driver who died while on duty of cardiac arrest.